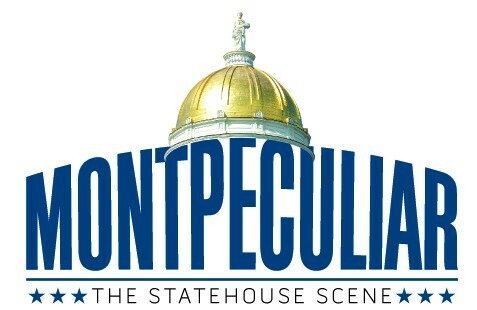 Montpeculiar: Who's Behind the Anti-Shumlin 'Sellout' Ad? Thursday morning at the Statehouse, Gov. 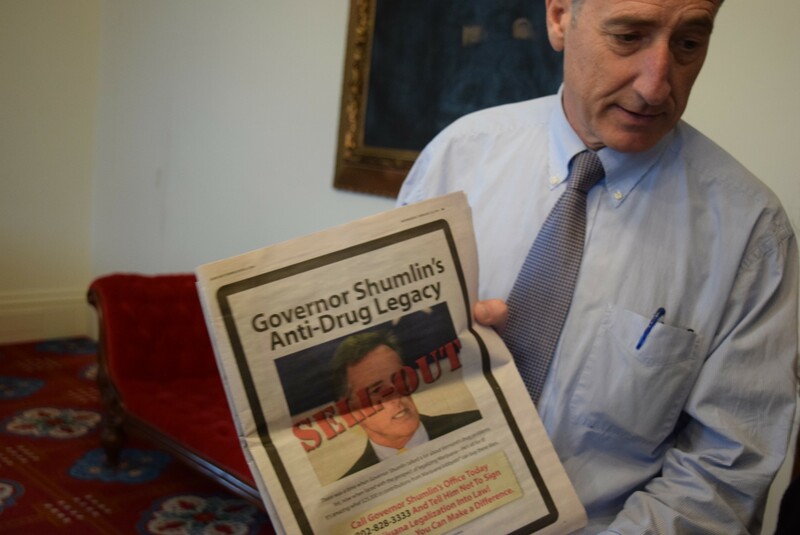 Peter Shumlin shows off an advertisement attacking him. On Wednesday morning, shortly before the Vermont Senate voted to legalize marijuana, a mysterious advertisement appeared on page nine of the Burlington Free Press. What made the ad so mysterious was that its sponsor was not identified. “Paid for by concerned Vermonters,” was all it said — in fine print, near the bottom of the page. 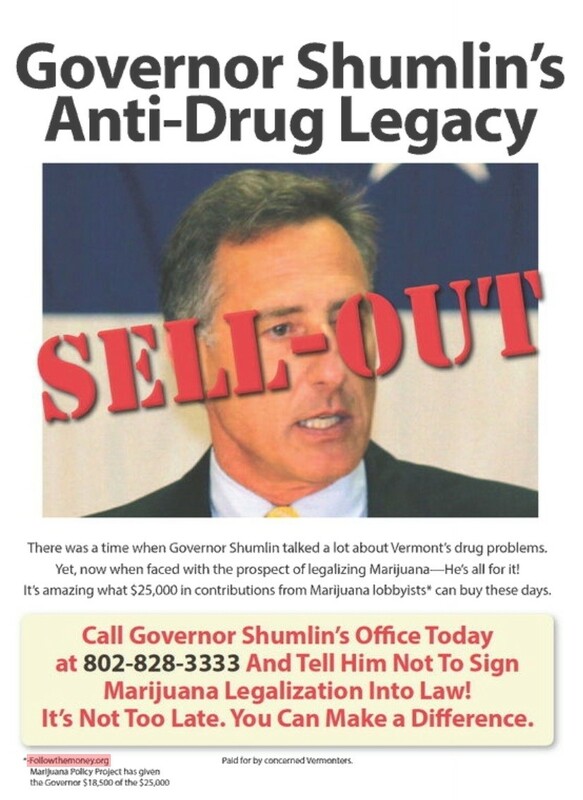 That had Shumlin wondering who paid for the ad — and whether it was legal. As it happens, Shumlin just last year signed a law requiring those lobbying state officials to identify themselves in advertisements seeking to influence the legislative process. The ad in question appears to meet that test. But according to Secretary of State Jim Condos, the new law only applies to registered lobbyists, lobbying firms and the businesses and nonprofits that employ them. “As it appears now, we would need more facts and information about whomever paid for this particular advertisement before we could say whether they should be registering as a lobbyist/employer and placing the identifying information on the ad,” Condos said. Assistant Attorney General Eve Jacobs-Carnahan, whose office would investigate such a matter, said “it’s not totally clear on its face” whether the law applies to private citizens who are not registered lobbyists. She said her office hasn’t yet received a complaint and would only pursue the matter if it did. Thursday morning, Shumlin sounded determined to find out. “We are going to ask the Free Press who bought that ad,” he said, after concluding an unrelated press conference in his ceremonial Statehouse office. He then turned to Free Press reporter Jess Aloe, who was standing nearby, and asked if she had any idea. She told the gov she had not seen the ad and knew nothing about it. Reached Thursday afternoon, Free Press publisher Al Getler said the ad had been placed by a third party on behalf of “a private citizen.” He said the paper had reviewed the relevant statutes and determined that it was entirely kosher for an individual to engage in such anonymous advocacy. Getler directed Seven Days to Phil Lassalle, an advertising executive from Charlotte, who placed the ad on behalf of a client. Lassalle initially said his client preferred to remain anonymous, but he eventually revealed that it was Tim Trevithick, a Shelburne resident and substance abuse counselor at Champlain Valley Union High School. Trevithick has been an outspoken opponent of legalization — and he’s publicly criticized the Shumlin administration for providing insufficient funding for substance abuse prevention programs. Shumlin won plaudits for devoting his 2014 State of the State address to opiate abuse in Vermont and has revisited the issue several times since. He also supports legalizing marijuana, and as the ad points out, he has received significant campaign contributions from advocacy groups that back legalization. According to Lassalle, Trevithick was not interested in speaking with Seven Days about the matter. His phone number is unlisted. “It wasn’t part of our strategy at SAM-Vermont — that’s for sure,” he said.